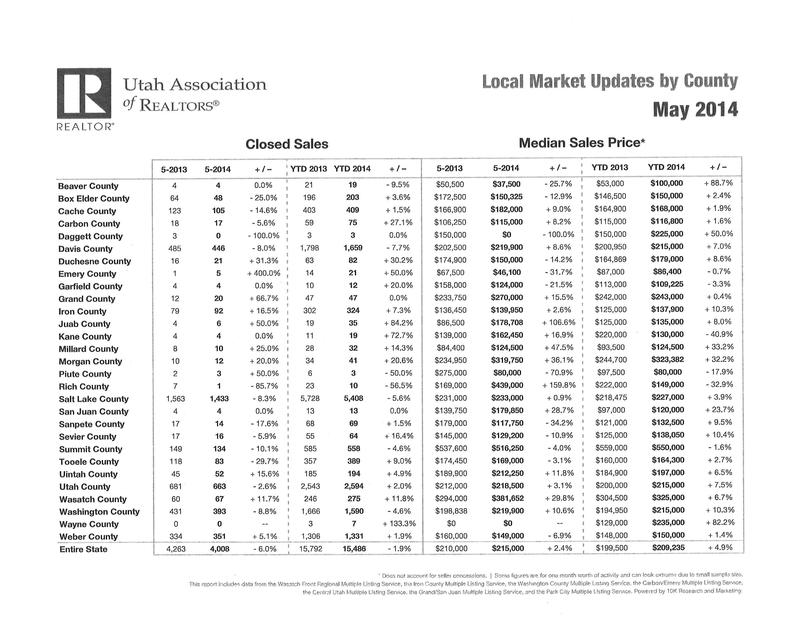 Exciting market information is attached for the entire Iron County Board of REALTORS for 2nd quarter 2014.These statistics include data from all real estate offices in our area. More homes are still selling under $200,000, but homes in all price ranges are selling. Commercial, land and development properties are taking a back seat to residential home sales. As you see, ERA Realty Center still sells more homes than any other office in the entire MLS. The real estate market in our area seems to be solid and steady. information for all of the counties. Closed sales in Iron County are up 7.3% year to date (YTD) as compared to 2013. The median sales price is up 10.3% YTD as compared to 2013 to $137,900. Beaver County’s median sales price is now $100,000 which is an 88.7% increase YTD as compared to the same time in 2013. Washington County’s median sales price is up 10.3% YTD to $215,000 according to this report. are at bargain levels. Sometimes real estate prices are up when interest rates are down and then interest rates are high when property prices are low like a see-saw. Buyers ‘monthly payment may be lower than rent in a market like this when both are low at the same time. Everyone is going to buy a home in their lifetime. Why not buy it for themselves now rather than for the landlord? It’s also a great time for sellers to sell, in our opinion, because there are buyers wanting to buy including investors, primary home buyers, buyers upgrading and buyers downgrading. upswing. Therefore, our answer to that question is, “Sell your home when you want to sell it, so you can move forward in your life in the direction in which you want to go when you want to go.” As long as you sell and buy in the same type of market, it is our opinion that you are okay. Sellers tell us they come out okay even if they had to discount to sell. Either way, it is believed that your life situation should dictate when and if to sell. buying and what owners can do to make sure their home is the one bought! We are happy to supply market data to determine market price. We even had a seller recently who wanted to sell his home for more because he was going to have to pay more for a home in the state to which he was moving. That obviously won’t work because buyers will compare the home to other homes here, and the seller will want them to choose his. In order to do that, the home must be priced with the market. like in order to find the best homes for them, and we encourage them to do so. However, the choice is theirs. When a buyer phones with a list of homes they want to see, we do show them our listings also whenever possible that match their search criteria. We work hard to find the home of their dreams, and we show listings from all offices but try to always include our own. If your home or property has not been shown and sold, 4 items need to be considered in order to discover how to get your home on the next buyer’s tour list and, even better, to mark it sold! 1. Marketing: The real estate marketing must be superior. The Naisbitt-Bagley Team aggressively markets their properties all over the world online, in print, by mail, and etc. We try to be wherever a buyer may be! We market to buyers as well as to real estate agents for maximum results. We don’t know which agent the buyer will call, so we may not be the one who sells the home or property, but we will be the reason it sells! We don’t know of anyone advertising more than we do! Our job will be done! to the seller, and they are as important as our marketing! Experience shows that it doesn’t matter how much advertising is done on a home or property, if the following 3 items aren’t in line with the market, the results are not going to be what is hoped for by the seller or the agents spending their advertising dollars. 2. Price: If there is no buyer, it doesn’t matter what the price of the property is. However, if there is just one buyer, the price of the property must be such that it attracts the buyer to look at the home. It needs to be the best buy in order to attract that one buyer. 3. Staged: Once the buyer comes to the home or property, it must show beautifully and be in prime condition unless it is discounted drastically. Buyers typically look at quite a few homes, and they usually pick the home that shows the best in the location they like. You want to make sure your property is staged and shows well to attract the offer. The Naisbitt-Bagley Team will be happy to help you make sure your home or property is in show condition. The way you show a home is often different than the way you sell it. It needs to be perfect enough to go in a picture because that is what happens and the picture goes all over the world and attracts buyers to see the home in person! 4. Available to show: The home or property needs to be able to be shown according to the schedule of the buyer; otherwise, it could be deleted from the list if they have to go back to a home at an inconvenient time out of sequence with the rest of the tour. expertise. They would love to answer your questions as to how to price and stage your real estate. Please call with any concerns and problems. You can also email naisbitt@inxsnet.com. They would love to help you make your real estate dreams a reality! They will work hard to make your transaction fun and easy–the kind of help you would expect from a friend! They care!